A handful of the Race Tech team is packing up and driving east to support our riders, dealers, and Centers from California to the Midwest. Through late July and early August, keep an eye out for the Race Tech Suspension crew at a track in your area. We'll be visiting dealers, Centers, and most importantly testing with our riders at various tracks and events throughout the entire journey. The team has a few big events planned along the journey. The first, a couple of testing and tuning days in Illinois on July 23rd and 24th. Next up, the crew will provide trackside support to all the racers at the Lake County Fair MX event in the Chicagoland area on July 25th and 26th. The final and largest stop will be at the AMA Amateur National Motocross Championships. Race Tech will have a booth setup at the event to service all of the riders competing for a prestigious AMA National Championship. "This is a great opportunity for us to show support to those outside of the west coast region," stated Rob Brown; Race Tech's General Manager/Head of R&D. Rob continued, "We want to continue to grow our base of both support riders and dealers, and the best way to do that is to support them in their backyard. We have a lot of top talent in the Midwest region. It's important for us to test and tune with these riders on the tracks they ride year round. Different dirt and track styles cause different challenges for suspension tuners, we want to develop the best product and settings no matter what the track is." Rob has deep roots in the Midwest, formerly owning his own engine and suspension tuning company in the region where he took multiple riders to wins and championships at all levels of competition. "It'll definitely be nice to get back to the area I call home. There are definitely many people I am excited to visit along the way," said Brown. Traveling along with Rob to spin the wrenches will be Scott Lillis who represents Race Tech at all the AMA Supercross and National events. They will be joined by Rider Support Coordinator Sydney Ruge and Marketing Director Chris Riesenberg. Riesenberg said, "Like Rob, I call the Midwest home. I grew up racing the tracks in this region, and it'll be great to 'come home' so to speak. This trip will be a great opportunity for us to spend some quality time with those who help spread the word about Race Tech in the heartland." "I'm excited to provide our audience with some great behind-the-scenes coverage of the trip, and more importantly; I'll be on the look out for new riders to add to our Race Tech Rider Support Team. We are always looking for riders who are performing well, but could use the help of better equipment to reach their goals," Riesenberg continued. 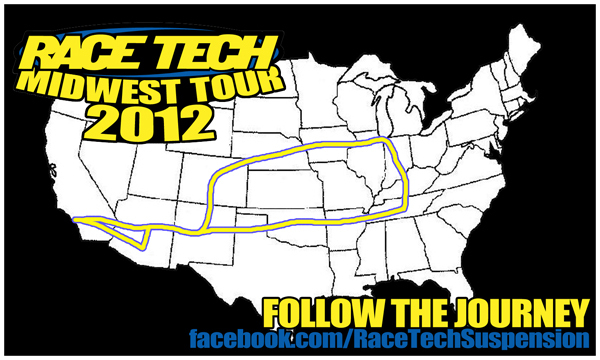 Be sure to LIKE Race Tech on Facebook to follow the journey and find out where you can meet up with the Race Tech team. July 23-24, 2012 - Testing and Ride Day at a location TBD in Illinois.